Summer Writing Lessons – Beat the Backward Slide! And just like that, summer is nearly upon us! Time absolutely flies when you are having fun, peeps. 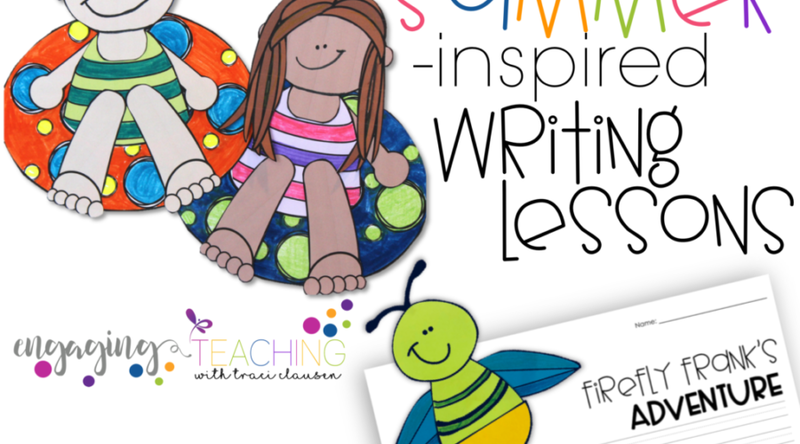 Have you thought about sending home some summer writing lessons? I have many things I like to send home with the kiddos to help them beat that backwards slide during the summer. One major thing I emphasize is writing. It’s a great way to ensure the kids are practicing their printing, grammar, phonics application, sight words and of course writing standards like staying on topic, opening and closing sentences, etc. This year I am sending home an expository and narrative writing lesson. My kiddos have worked on these types of lessons every week all year-long with many of our thematic writing lessons AND through our Engaging Writing work. So, they know exactly what to do. They also know they can expect a craft at the end… so I’ll send home the makings for that, too! This cutie expository lesson gives them the opportunity to expound on all of the fabulous things about summer. Sensational Summer includes differentiated writing plans so I can send home exactly what each kid needs. I will also include the actual lesson and my sample plan. The little peeps are obsess with firework displays. This little cutie will help them use their imagination to write about fireworks and a firefly! Firefly Frank’s Adventure writing lesson includes all of the same writing plans my kids are used to using and understand thoroughly after all of our Engaging Writing lessons so they will know exactly what to do. Of course there is the sample and the thorough lesson plan. If I had more time, I would love to do these in class with my students. But I really think they will enjoy having the opportunity to work on it at their leisure at home, too! Sending meaningful and engaging work home with your kids for the summer is an awesome way to prevent that backwards slide. Click the resource covers to find them in my store. That's a great idea! Do lots of your kids complete it?